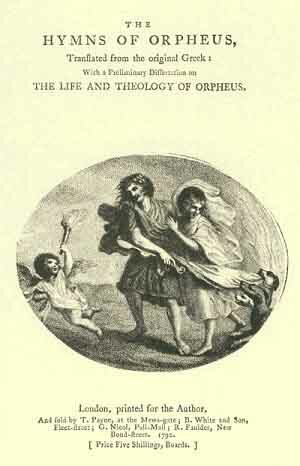 The Orphic Hymns are a set of pre-classical poetic compositions, attributed to the culture hero Orpheus, himself the subject of a renowned myth. In reality, these poems were probably composed by several different poets. Reminiscent of the Rig-Veda, the Orphic Hymns contain a rich set of clues about prehistoric European mythology. This translation by Thomas Taylor, a British neo-Platonist classicist, is of additional interest for its introduction and extensive footnotes, which discuss in great detail Taylors' philosophy. Taylor, who was considered a bit outside the pale by contemporary scholars, was an influence on successive generations of occultists such as the Theosophists and the Golden Dawn, and in the 20th Century such writers as Manly P. Hall. Production Notes: The original book printed 's' as 'f' extensively. These have been consistently changed to 's'; except in some doubtful words, which are left as printed in the original; these are marked in bold type. The Greek passages in this document have been converted to Unicode. Note that there are several archaic Greek letters in this text for which there is no Unicode equivalent currently, or which were so illegible in the original no certain transcription could be provided. These have been transcribed with # in place of the dubious glyph, and an image of the word is inserted after the transcription.